Nick Moss is a BIG Man. Not just physically. He’s a huge spirit, a reservoir of wit and humor, harbors an enormous love of the blues tradition. On top of that a prodigious talent with guitar to go along with a grizzly bear voice that fills the room. 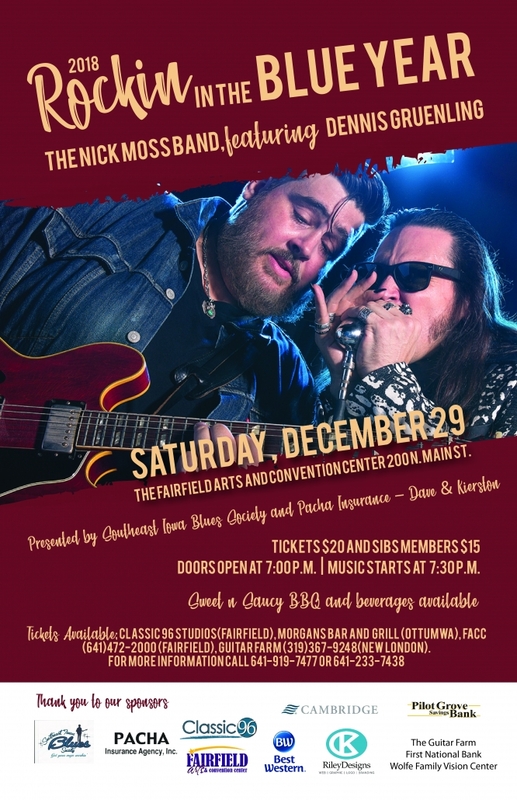 When you add world class harp player Dennis Gruenling to a backing band as fine as you can find, you end up with a concoction that will have local blues fans salivating when Moss and company descended on The Fairfield Arts and Convention Center Hall, Saturday December 29th. We will again have Sweet and Saucy Barbacue and a great bar available. SAVE the DATE for this AWESOME evening of the BLUES!!! Tickets $20 and for SIBS Members $15.